While there are more than 15,000 museums in our country, visitors only get to see about 5 percent of any institution’s collections. Most museums simply don’t have room to display everything they’ve got. But there are a wide variety of other surprising and intriguing reasons why, for example, the Smithsonian Institution doesn’t display its collection of condoms, why the Field Museum locks up its shrunken heads and why the bones of a former slave named Fortune were hidden away for years in the basement of Connecticut’s Mattatuck Museum. For years, I’ve been talking my way into the backrooms of museums to get the stories behind these hidden museum treasures. Many of those stories have become entries in my regional travel books and others became radio pieces in my Hidden Treasures Radio Project that aired on National Public Radio. That 26-part series included the stories of a quilt made of Ku Klux Klan masks, time-capsules at the Andy Warhol Museum, the final resting place of the tombstones of Richard Hickock and Perry Smith – the two killers portrayed in Truman Capote’s book, In Cold Blood – and the odd things given to U.S. presidents and vice-presidents as gifts. More recently, I gathered up the stories of hidden museum treasures for two slide shows that appeared on Bing Travel: Hidden Museum Treasures and Hidden Treasures of Presidential Museums. Now I’m working on putting these stories, and the stories behind many other hidden museum treasures, into a book to be published by the Globe Pequot Press in 2013. Excerpts from that work in progress, and many other museum tidbits I find along the way, will show up here on the Museum Mysteries website. 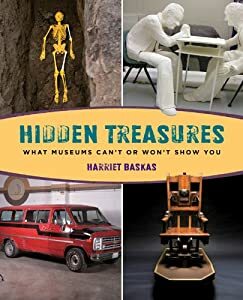 Send me your nominations for hidden treasures to include in the book and, please, come along as I work on finding the stories behind some great objects.